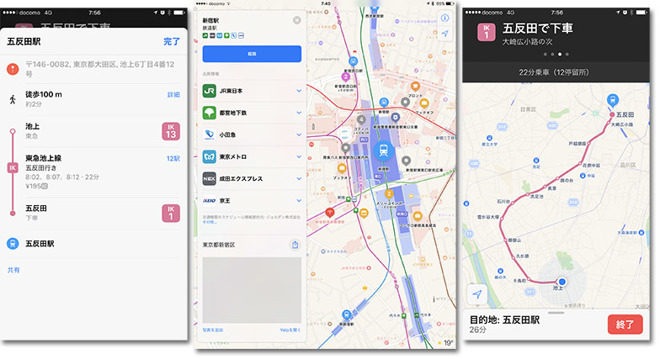 First announced in July, and set to arrive alongside Apple Pay as part of iOS 10.1, Japan's version of Transit integrates public transportation timetables and first-party indoor mapping data directly into Apple Maps. Support appears to be rolling out in urban centers nationwide, though Apple's official coverage area is as yet unannounced, reports local blog Ata Distance. Rail transport timetables are a particularly important service in the bustling metropolis of Tokyo. With iOS 10.1 beta, Apple Maps pulls data from a variety of third-party services to deliver up-to-the-minute arrival and departure times, as well as comprehensive line hopping directions. In Tokyo, for example, Transit supports lines operated by JR Tokyo, Toei, Odakyu, Tokyo Metro, Narita Express and Keio. In addition to train times, Apple includes indoor maps for large railway stations and underground subway stops. Apple reportedly started work on the indoor mapping effort in August. With iOS 10.1, Apple is expected to roll out an Apple Pay iteration in Japan that goes hand-in-hand with the upcoming Transit capabilities. Specifically, iPhone 7, iPhone 7 Plus and Apple Watch Series 2 models sold in the country support FeliCa Type-F NFC contactless technology. The implementation extends Apple Pay support to Suica transit cards from JR East and tap-to-pay systems from Docomo and QUICPay. Apple CEO Tim Cook during a recent trip to Japan took the opportunity try out Suica at a toll gate on JR East's Yamanote Line in Tokyo. Whether or not he used Transit directions to make it to his train is unclear. Launched last year as part of iOS 9, Transit delivers top-down views of underground subway and train stations, as well as graphics that match local road signage. The extra information helps users plan a more efficient commute, and is especially useful when traveling to unfamiliar cities, Apple says. The unique features, which go above an beyond transit navigation offerings from the likes of Google, are needed as Apple plays catch-up with its competitors. Transit availability is limited to large metropolitan areas in the U.S., as well as select cities in Australia, Brazil, Canada, China, the Czech Republic, England, Germany and Mexico. Apple is rumored to release iOS 10.1 with Apple Pay on Oct. 25.